27:12 The Lord said to Moses, “Go up this mountain of the Abarim range, and see the land that I have given to the Israelites. 13 When you have seen it, you also shall be gathered to your people, as your brother Aaron was, 14 because you rebelled against my word in the wilderness of Zin when the congregation quarreled with me. You did not show my holiness before their eyes at the waters.” (These are the waters of Meribath-kadesh in the wilderness of Zin.) 15 Moses spoke to the Lord, saying, 16 “Let the Lord, the God of the spirits of all flesh, appoint someone over the congregation 17 who shall go out before them and come in before them, who shall lead them out and bring them in, so that the congregation of the Lord may not be like sheep without a shepherd.” 18 So the Lord said to Moses, “Take Joshua son of Nun, a man in whom is the spirit, and lay your hand upon him; 19 have him stand before Eleazar the priest and all the congregation, and commission him in their sight. 20 You shall give him some of your authority, so that all the congregation of the Israelites may obey. 21 But he shall stand before Eleazar the priest, who shall inquire for him by the decision of the Urim before the Lord; at his word they shall go out, and at his word they shall come in, both he and all the Israelites with him, the whole congregation.” 22 So Moses did as the Lord commanded him. He took Joshua and had him stand before Eleazar the priest and the whole congregation; 23 he laid his hands on him and commissioned him—as the Lord had directed through Moses. 9:26 When he had come to Jerusalem, he attempted to join the disciples; and they were all afraid of him, for they did not believe that he was a disciple. 27 But Barnabas took him, brought him to the apostles, and described for them how on the road he had seen the Lord, who had spoken to him, and how in Damascus he had spoken boldly in the name of Jesus. 28 So he went in and out among them in Jerusalem, speaking boldly in the name of the Lord. 29 He spoke and argued with the Hellenists; but they were attempting to kill him. 30 When the believers learned of it, they brought him down to Caesarea and sent him off to Tarsus. 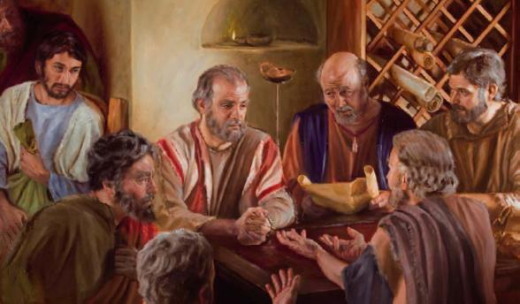 When Saul had come to Jerusalem, he attempted to join the disciples; and they were all afraid of him, for they did not believe that he was a disciple.